SEO (Search Engine Optimisation) is a digital marketing discipline that focuses on the manipulation of search engine results. This manipulation relies on a combination of strategic keyword use and quality or relevance of website content alongside other behind the scenes actions to determine websites ranking in a search engines results. The higher the ranking is, the more likely a potential customer will end up navigating to the website and therefore leads to more business. How many keyword phrases can I target? We don’t limit the number of phrases you can target. We investigate suitable phrases for you to target that will provide you with the best return, taking into consideration your: budget, search volume, and the competitiveness of the phrases you choose to target. 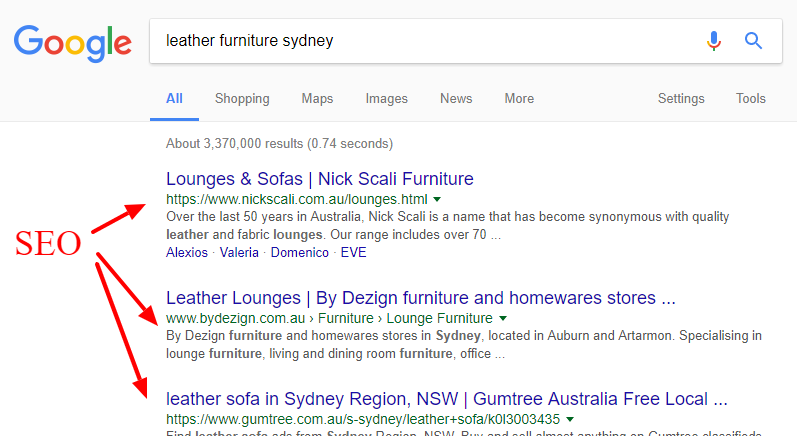 How long does it take results to show from SEO? The main indication that SEO is working is an increase in traffic to the site alongside conversions. We can also provide a keyword position report as frequently as requested (e.g. daily, weekly, monthly) so that you can monitor your user account. The report enables you to gauge the performance of your current targeted keywords. All our customers also have 24/7 access to all keyword statistics online. It’s difficult to answer this with certainty. Cost depends on the optimised keywords, the industry, the site’s evaluation in the eyes of the search engine and particularly, the competition. Our prices start from $1,000 per month, however, each package can be negotiated individually. Our services include not only SEO service, but also web-design and internet marketing services. Our team is comprised on experienced IT people, web designers and marketing specialists. A good site raises the prestige of your organisation and inspires confidence. This leads to the achievement of greater profits.